Home > Products > Is This Panama? SOYEON KIM is a Toronto-based, Korean-born artist who specializes in work that merges real-world materials and fine sketching and painting techniques to produce three-dimensional pieces. She is a graduate of the Visual Arts program at York University in Toronto. When Sammy, a young Wilson's warbler, wakes up one frosty August morning near the Arctic Circle, he instinctively knows that it's time to make his first migratory journey south to Panama. But there's one problem — where's Panama? 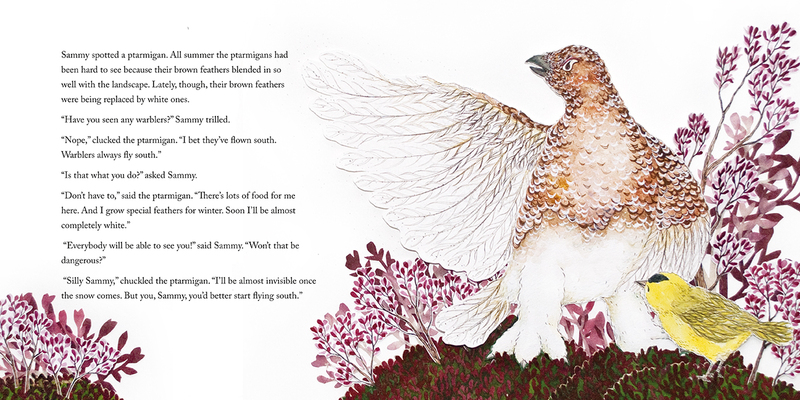 All the other warblers having left without him, Sammy sets off on his journey by himself, stopping to ask the same question of each of the different animals that he meets along the way: "Is this Panama?" From the caribou heading to his winter forest to the monarch butterflies flitting to Mexico, every animal has a different destination and different advice for Sammy on how to find his way. Finally, a flock of his warbler cousins shows Sammy that finding Panama is as easy as following the stars. Animal migration patterns and seasonal changes are on display throughout this fascinating story, complemented by intricate paper collage, watercolor, and pen-and-ink illustrations. 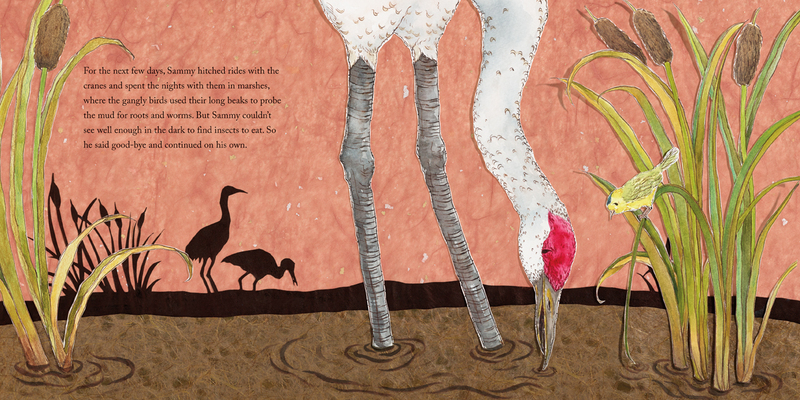 Together, the text and images help make sense of a few of nature's curiosities. A truly educational journey. "Thornhill nicely captures the tension created by the collision of Sammy's excitement for the mysteries surrounding his first migration with the dangers and hardships associated with the sheer exhausting length of the journey. ...Kim's gorgeous illustrations combine watercolour paintings, ink and cut-paper collages, vibrant in colour and rich in detail." "Full of information, including a map of migrations routes, the book gives plenty of information about how different animals migrate to find better nesting grounds or food in addition to a good story."